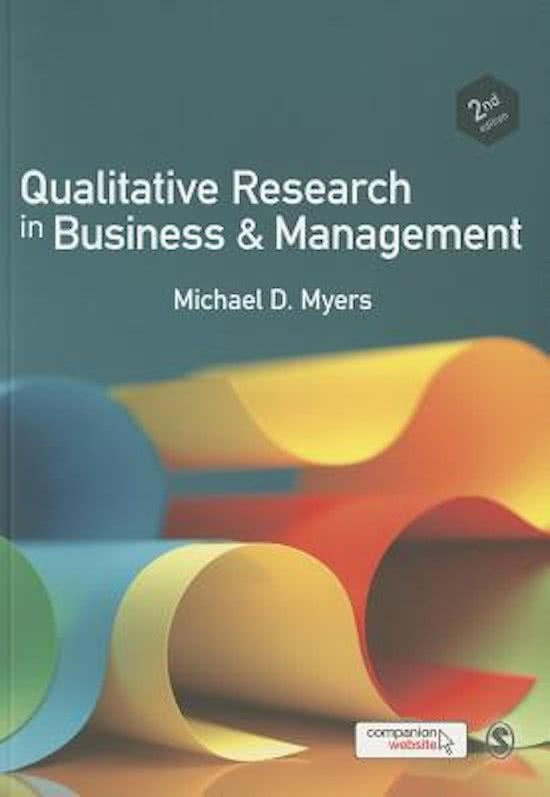 More book results for "Radboud Universiteit Nijmegen > Bedrijfskunde"
Qualitative Research in Business and Management - Michael Myers Boek Michael Myers: Qualitative Research in Business and Management: Hoofdstuk 2 tot en met 13, 17 en 18 (engels boek, engelse samenvatting). Summary Qualitative Research in Business & Management Summary of an honors student. Qualitative Research in Business & Management - Michael D. Myers. Chapters 2-13, 17 and 18. Summary Myers - Qualitative Research in Business and Management edition 3 Summary of the book Qualitative Research in Business and Management (edition 3). Part of the course Kwalitatieve Onderzoeksmethodology / Qualitative Research. Kwalitatieve Onderzoeksmethodologie 'Case Study Research' Samenvatting Summary Yin, R. (2013) Case study research; design and methods, 5th edition. Sage: Los Angeles.